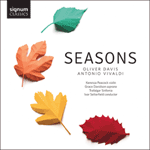 In September 2014 Ivor Setterfield and I discussed the concept of an album based around Vivaldi’s Four Seasons incorporating a complementary original work, perhaps for voice and strings. I decided to look for poetry based on the seasons and then set this in the form of a song cycle. Whist researching potential texts I soon discovered (as many already knew) that Vivaldi had based the Four Seasons on four existing poems; in fact some believe the poems to be by Vivaldi himself, since they very conveniently support the structure of the four concertos. Di primavera all’ apparir brillante. are softly caressed by the breezes. up their charming songs once more. the goat-herd sleeps, his faithful dog beside him. E de mosche, e mosconi il Stuol furioso. the turtledove and finch are heard. north wind sweeps them suddenly aside. Out of their sweetest slumber to fine enjoyment. Mentre la pioggia fuor bagna ben cento. Quest’ é ‘l verno, mà tal, che gioja apporte.